A Pop of Colour - Page 411 of 413 - Beauty, lifestyle, and more. So for awhile now I have had the idea to really spice up a pair of 3-D glasses. A month back I came up with these beauties and although I haven’t seen a a 3-D movie since February (Never Say Never 3-D) to test them out, I thought I would share my creation with all of you! I think that the 3-D glasses in theatres are just so boring, and okay, I know what you are thinking, “who cares, you are there to watch a movie, no one is going to be paying attention to what is on your face” but I love sparkly things so I thought, how cool would it be to bedazzle a pair of glasses?? I had a really cute headband that had little gems on it that unfortunately broke so I took off all the sparkles and attached it to these babies. I thought I would share the process with all of you just in case you want to get creative too! Gems- Like I said I got these from a headband that broke but check out an arts supply store like Michaels or even your local Wal-Mart. Glue- I used eyelash adhesive because it sticks very well, but if you are very careful you can try this with super glue too. 3-D Glasses- You get these for free when you watch any 3-D film, it is included in the cost of your admission. 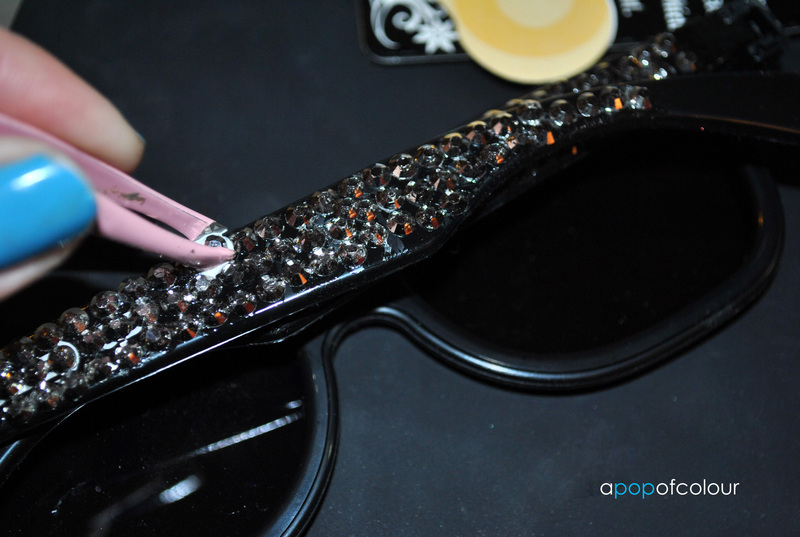 Using your tweezers, pick up one gem at a time and dip it in the glue. Wait for the glue on the back to get a bit tacky before you apply it to the glasses. You will need to dip and apply each gem one at a time until the arm is full, or you could create some funky designs instead. The glue I’m using is white but dries clear, there is some clear eyelash adhesive out there as well if you choose to use this as the glue. I couldn’t find my super glue and I’m quite clumsy so I thought this would be the safest bet. Once you have all the gems on there I do recommend going over the entire arms with clear glue to really set the gems. After that you are done! Pretty easy hey? You can also add gems to the front of the glasses as well. I thought it really added some flair to the entire look. So there you have it! Bedazzeled 3-D glasses. Like I said, I have not tried these out yet in theatres and I hope they don’t set off too much glare thus annoying people, but I think they are cute and totally make a statement. Let me know if you try this and how yours turned out! So after my lash fill on Friday I figured it was time to go out and get a good eye makeup remover. 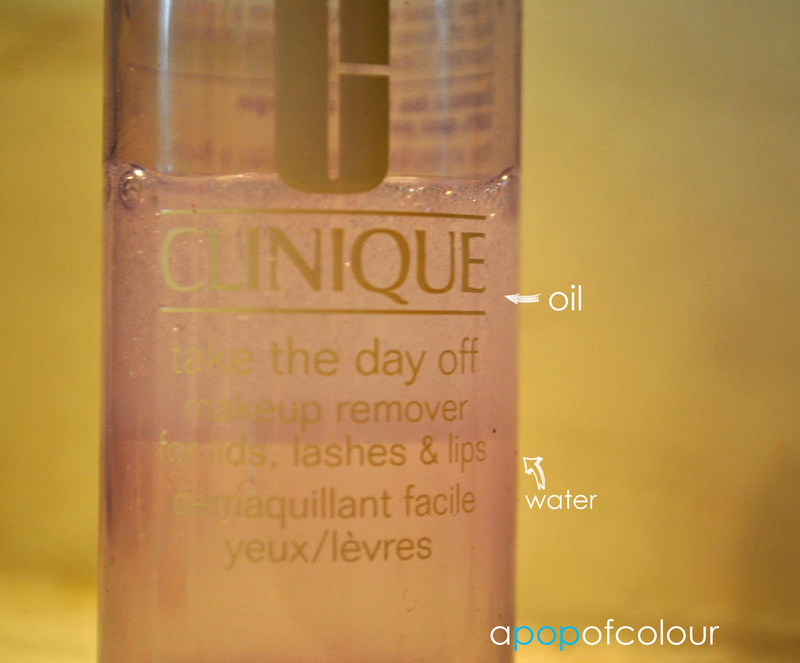 Up until this point I have been using Clinique’s Take the Day Off Makeup Remover for Lids, Lashes, and Lips, but it is an oil-based remover and those types aren’t recommended for eyelash extensions. I thought it wouldn’t matter but after a few days of using it I did notice that more lashes than usual would fall out. 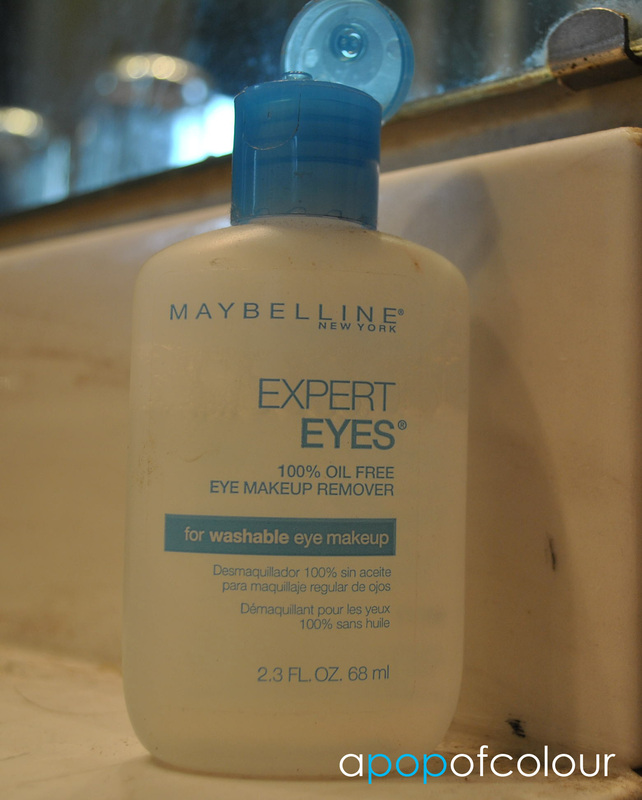 So I tried an old bottle of Maybelline’s Expert Eyes, a 100 per cent oil-free eye makeup remover, but honestly the stuff is just like glorified water, it didn’t do anything. So yesterday I figured I would go pick up MAC’s Pro Eye Makeup Remover and so far I really like it. I thought I would do a comparison between the three because upon reading reviews online I discovered that a lot of people are comparing MAC’s product to Maybellines. So I thought I would do my own review with the two products, as well as an oil-based remover like Clinique’s. I also thought I would do a test as well. 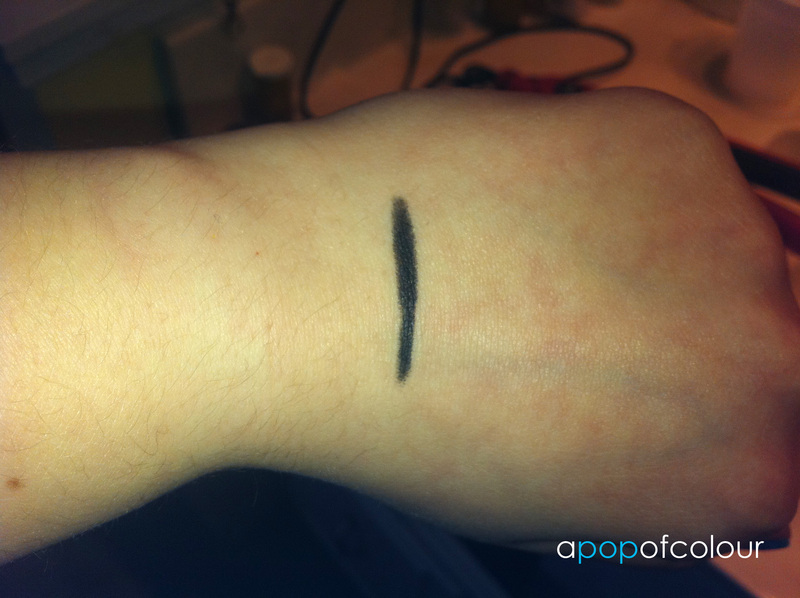 I took my Joe Fresh black eyeliner and drew a line on my hand and then, using each remover one at a time, I counted the number of swipes it took to completely remove the liner. This 100% oil-free formula gently and effectively removes washable mascara and eye makeup without oily residue. The product comes in a 2.3 fluid ounce, 68 ml bottle. It has a flip top lid and you squeeze the solution out. Formulated to gently and effectively remove washable mascara and eye makeup without oily residue. Moisten cotton or tissue, squeeze to remove excess. Close eyes. Gently press against lid, hold for a few seconds. Gently wipe off. Rinse with water. On the swipe test, I had to swipe this product a staggering 18 times before the eyeliner wasn’t noticeable anymore. That’s a lot, and I bet you you would probably get the same results with water. I think this product retails for $4-5 in Canada, but I wouldn’t waste your money on it. 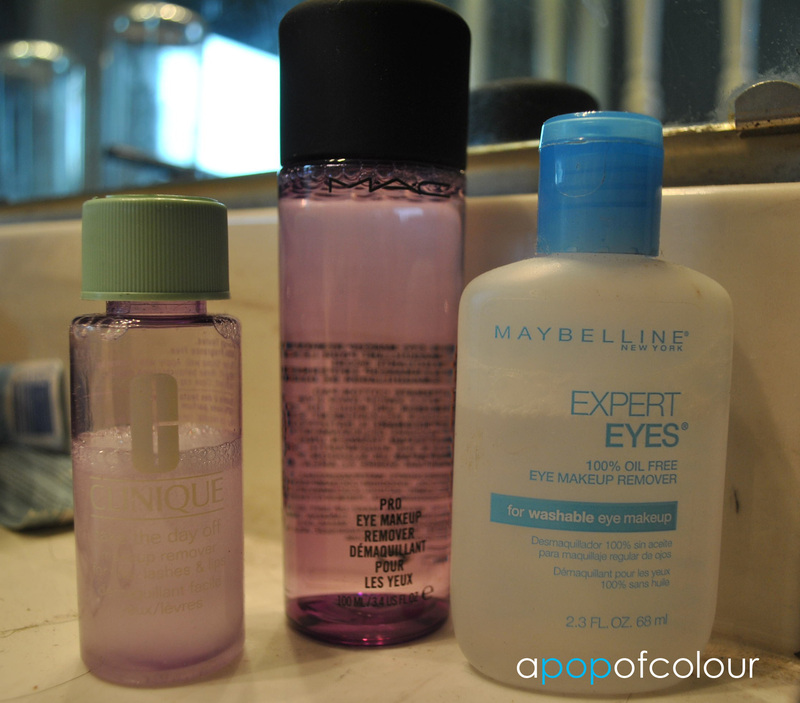 Try to find a better makeup remover that actually does what it claims – remove makeup. A mega-effective remover that lifts off every look – from delicate to dramatic – without smudges, tears or aggression. Pro-quality, yet decidedly gentle; calms, hydrates and soothes skin with cucumber extract. Makeup can be immediately reapplied. A favourite of busy models. The bottle is a screw off top with a little opening inside so you can dip a Q-tip in it. It is 100ml and 3.4 US fluid ounces. Saturate cotton pad. Gently sweep over eye area. I really liked this product. Like I said in the beginning of the post, I have only used it once because I got it yesterday, but if you need a good oil-free makeup remover I would recommend this one so far. It is a bit pricey however, $21.50 in Canada and $18 in the U.S. and I’m not sure how long the stuff will last for. I don’t typically use a makeup remover every day because it depends what I’m wearing on my eyes. Most times water and soap will remove the product, however, there are the odd times where it just won’t come off. If you use this product everyday, it can probably last you two months max I would say. As for the swipe test, it did really good. I only had to swipe the cotton ball four times before the eyeliner was gone. All in all, if you are looking for a oil-free remover and don’t mind spending the money, then give this one a try. Much better results than Maybellines. Shake well before using, then saturate 100% cotton ball with remover. Cleanse one eye area at a time. Apply to eye area and hold for several seconds, then wipe with downward strokes. Repeat using fresh cotton ball if necessary. Use a new saturated cotton ball or tissue for lipstick removal; rinse with cool water. I just want to start off by saying that I have the mini version of this product, the ones you get with the Clinique bonus times. A full-size bottle is 125 ml and retails for $21.50 Canadian, so the same as MACs. The bottle’s cap is similar to an Advil bottle, you know those child-proof kinds that you have to press in and turn? It’s one of those. This particular remover has two levels to it – water and oil. You shake them up and it will create the makeup remover. I have always liked this product, I have had a full-size bottle of this in the past and thought it worked wonderfully. The only thing that is a bit annoying is that wherever you use it it leaves an oil residue that you have to rub off. Not a bit deal though, I think the pros definitely outweigh the cons when it comes to this product. For the swipe test, it did the best out of the three- the liner was gone in three swipes. I did expect it to do the best as I have always found oil-based removers to take off makeup the best compared to anything else out there. So to sum everything up, I would say to skip Maybelline’s Expert Eyes, I would try MAC’s Pro Eye Makeup Remover (it is a bit pricey though) if you want an oil-free based remover and Clinique’s Take the Day Off remover is very good as well if you like an oil-based solution. 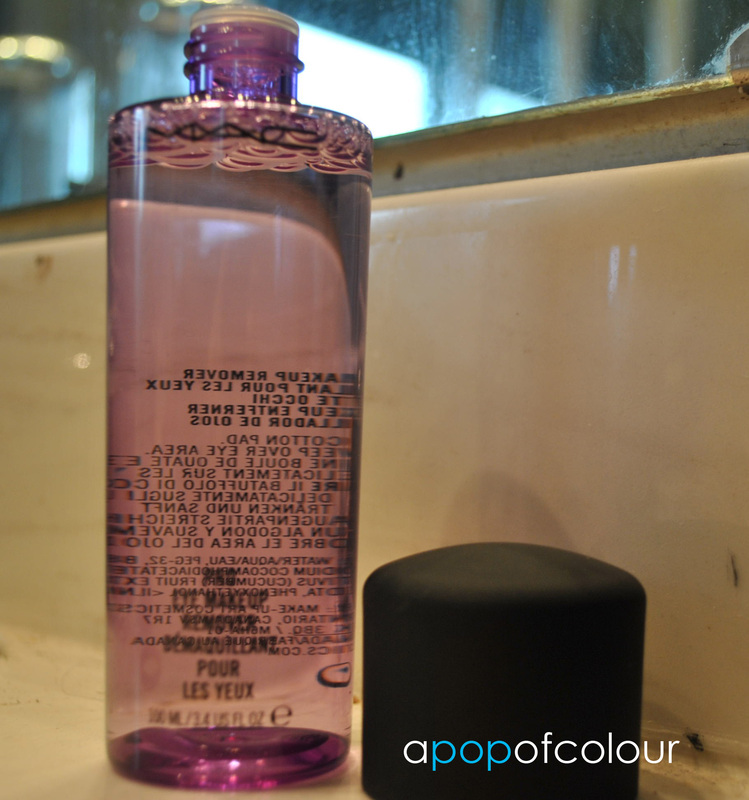 What are some of your favourite makeup removers? If you know of a good oil-free one please let me know because I love trying new products. So I loved doing a favourites post so much that I thought I would do another one but about other things non-beauty related. Stuff I loved last month (I’m a little late with this one…) other than beauty and fashion. Whether it was music, movies, books, etc. Okay, number one would definitely be Britney Spears’ Femme Fatale, although this will probably be on April’s list as well because the CD came out on March 29th. 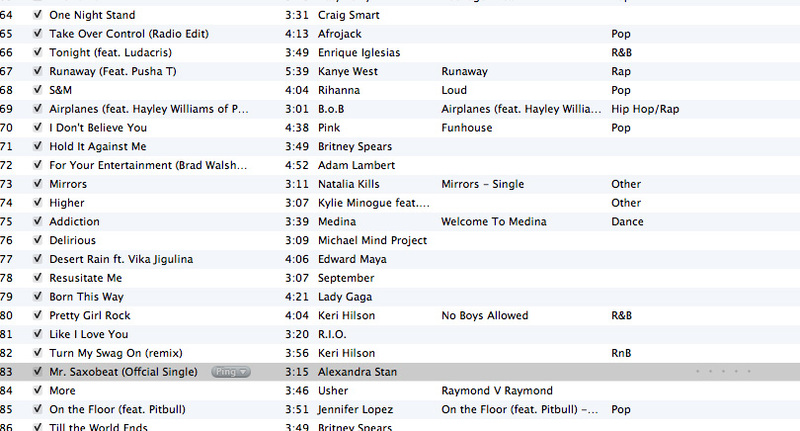 All the songs are so good and it is on crazy repeat right now. “Like I Love You” by R.I.O. I liked a lot of other stuff as well but these were my favourites. I don’t think I actually saw a lot of movies this month. Let me think here… when did Never Say Never come out? February? Well regardless, that was a good movie, I’m not ashamed to say that I love the Biebs. I saw this really weird foreign film on Netflix actually, it was called XXY and it’s an Argentinian film that was Spanish with English subs. The movie was about an inter-sexed 15-year-old girl named Alex who is going through this identity crisis after this doctor and his family moves in with their family and she falls for their son. I don’t want to spoil the end of the movie in case anyone actually watches it, but her challenge, as well as her family’s, is whether she will stay a girl (by her keeping on taking her medication), or go off and turn into a boy. It was kind of a weird movie and definitely not kids or anything but it was interesting enough to watch. Whenever I’m bored and can’t decide what to watch I always look at the foreign films, I enjoy them a lot and you get to see a different culture. I especially like Spanish language films because the subject matter is usually really good. One of my favourite films actually is called Todo Sobre Mi Madre (All About My Mother). It’s a film by Pedro Almodovar (he did Volver and a number of other Spanish-language films), a very well-known Spanish director. I believe that Penelope Cruz is in the majority of his films (including this one). Anyways, this is something for another post, but if you come across this film, definitely check it out. I didn’t read anything this month! Shame on me! 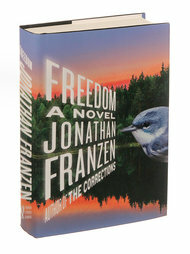 I’m still trying to get through Freedom by Jonathan Franzen, it’s really good but I haven’t had time to read it (the chapters are long!). I did pick up Good Housekeeping’s Drop 5 lbs: The Small Changes, Big Results Diet at the library and that was pretty informative. It had some really great recipes that I unfortunately didn’t have time to try. Okay, favourites for this month is easy: Kourtney and Kim Take New York, Holly’s World, 18 To Life, and Desperate Housewives, although I think there has been like one new episode maybe this month. I just want to say real quick how much I love 18 To Life. It’s a show on the CBC which I found on Netflix. It’s about these 18-year-old neighbours that decided to get married much to their parents disapproval. They end up living in his parents attic apartment and it’s about the relationships between the two families. The show is also set in Montreal and I love that city so that may be why I like it so much. But anyways, it’s actually so good. I have been really into CBC programming, in the past I was all about the U.S. networks, but between 18 To Life, Dragon’s Den, and Being Erica the CBC is slowly becoming my new favourite channel… well other than E! Canada, CosmoTV, and MTV. That’s all folks! Let me know what you have been liking this month, everything from music to movies to television, I want to know!